- -: Report of the Thirty-Seventh Conference. Held at Oxford in the Hall of the Union Society, August 8th to 12 th, 1932. - -: NATO at a Glance. A factual survey of issues and challenges facing the Alliance at the end of the 1990s. - -: The Unfolding Lotus: East Asia's Changig Media. A Report of The Freedom Forum Media Studies Center. At Columbia University in the City of New York. - -: Nations in Transit 2002. Civil Society, Democracy, and Markets in East Central Europe and the Newly Independent States. - -: Instruments, Surgical Equipment, Supplies, for Physicians, Hospitals, Clinical Laboratories and Industrial First Aid Deparments. 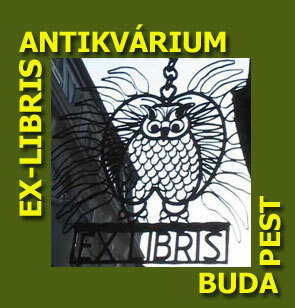 - -: Catalogue of books and papers. mainly for the year 1912. 557 l. Címlapjának teteje szakadt. Szabolcsi B. - Tóth A. (szerk. ): Zenei lexikon. A zenetörténet és zenetudomány enciklopédiája. Második, potlással bővített kiadás. I-II kötet.